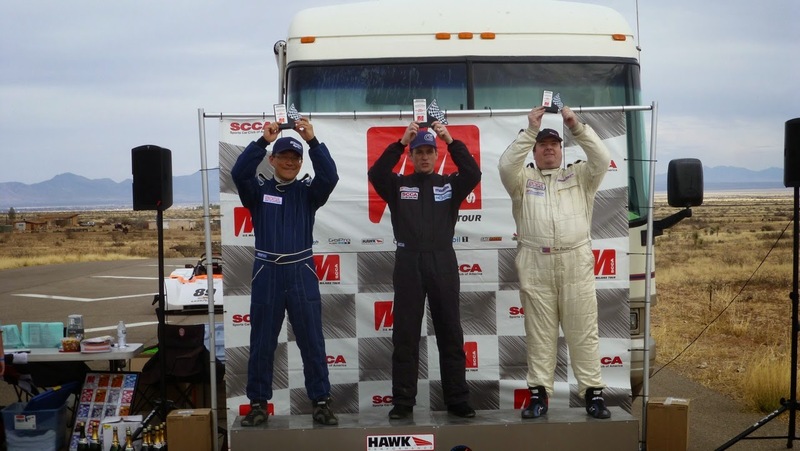 WILLCOX, AZ – February 23, 2014 – Team Honda Research-West drivers Mike Tsay, Matt Staal, and Lee Niffenegger traveled to Inde Motorsports Ranch in Willcox, Arizona February 22-23 for the second round of the SCCA Western Conference Majors Tour. The Majors events consist of a 30-minute “sprint” race on Saturday with a 40-minute “feature” race on Sunday. Mike Tsay was competing in the B-SPEC class with a 2010 Honda Fit, while Niffenegger and Staal piloted their 2012 Honda Civic Si’s in the Touring 4 category. THR-W drivers participated in the Friday test day to familiarize themselves with the Inde Motorsports circuit. The track was new to almost all SCCA competitors, and what they found was a highly technical track with slow hairpins, blind crests, and fast, sweeping corners. Lap times consistently dropped throughout the day as the drivers became more familiar with the track. Saturday morning dawned cold and clear while the team prepared for qualifying. The technical nature of the track made passing difficult, so achieving a good qualifying position was critical. Niffenegger and Staal posted 1-2 qualifying times in the T4 class. In B-SPEC, Mike Tsay grabbed the pole for THR-W over a Mazda2 and the Honda Fit of HPD Race Club’s Tom Grosart. Race One lived up to expectations as Niffenegger and Staal battled traffic and each other for the Touring 4 victory. Niffenegger pulled out an early lead, but eventually found himself held up by a car that was faster on the straightaways but slower in the corners. This allowed Staal to catch up to his teammate's bumper late in the race. Staal was able to have a look heading into Turn 1 when Niffenegger was slowed by a lapped car. However, Niffenegger held his teammate off and the finishing order remained unchanged as both drivers collected valuable points towards the Western Conference Majors standings. Mike Tsay also had a tough race in his Honda Fit. His challenge was to maintain momentum, keeping B-SPEC competitors behind him while allowing faster traffic to safely pass. The Sunday Feature was much calmer from a traffic standpoint for the faster T4 cars. The biggest challenge proved to be tire wear. Not only was the track filled with demanding turns, but the surface was quite abrasive. Both THR-W T4 drivers noticed high rates of wear to the left front tires following the shorter Saturday race. Knowing that the Sunday race would be longer, both Staal and Niffenegger had to balance speed with tire management. Niffenegger started on T4 class pole by virtue of having the fastest lap of the weekend. He translated this into his second win of the weekend and fourth straight to start the Majors Tour. The Sunday race saw an even tighter B-SPEC duel. Armed with data from qualifying and the race, Tsay looked for precious seconds to try and hold off (FIRST NAME???) Ambrose. Tsay started in front again, but despite upping his race pace bynearly two seconds, Ambrose was a constant presence in the FIT’s rear-view mirror. About halfway through the race, Ambrose dove inside at the end of the straight and made a clean pass. Ambrose held on for the win, with Tsay and Grosart finishing second and third, respectively. Following the Inde round, Niffenegger has stretched his points lead in Touring 4, with Staal running second overall. In B-SPEC, Mike Tsay holds a solid second place in points. 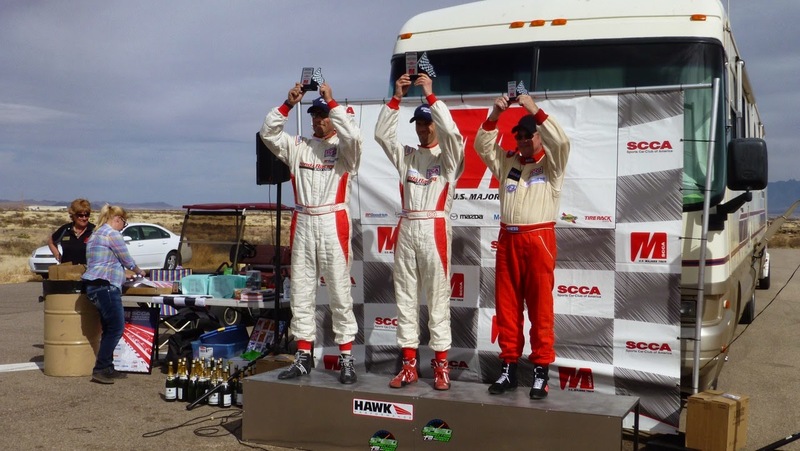 The SCCA Western Conference Majors season continues on the weekend of April 12 at Thunderhill Raceway Park in Willows, CA.